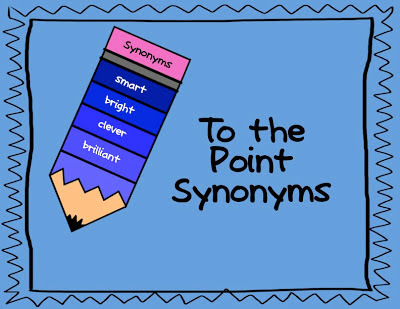 I'm loving my newest product, To the Point Synonyms. "To the Point" packs for other concepts are already in the works too, so be looking for them. I've already made other ones for Categories , Guide Words , Word Families, Prefixes and Suffixes, and Analogies also. 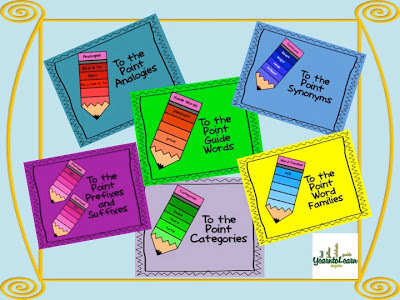 Getting to the point, this new pack is great for working with synonyms, using a thesaurus and practicing study skills, using detail and varying word choice in writing, and discussing shades of word meaning. And since I haven't done a giveaway in way too long I'll be giving 3 lucky winners a copy! Entries can be earned with Rafflecopter. Looks like a wonderful review for my kiddos! I like the pencil graphics! I am an SLP and would love this for my students. This would be great for my third graders!! Looks great...can't wait to see the next batch!